About Us About Us - RocGuru: GST Filing| Business Registration |Trademark | EPF & ESIC Compliance. 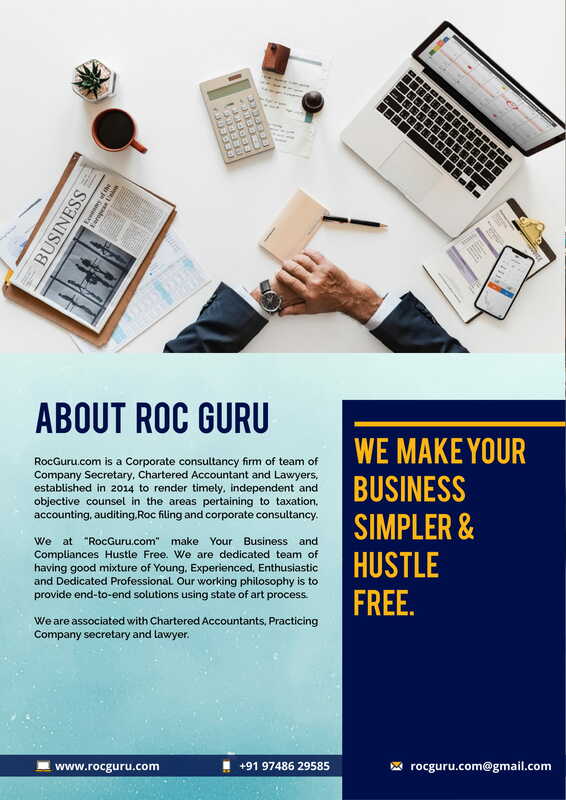 RocGuru.com is a Corporate consultancy firm of team of Company Secretary, Chartered Accountant and Lawyers, established in 2014 to render timely, independent and objective counsel in the areas pertaining to taxation, accounting, auditing,Roc filing and corporate consultancy. We at “RocGuru.com” make Your Business and Compliances Hustle Free. We are dedicated team of having good mixture of Young, Experienced, Enthusiastic and Dedicated Professional. Our working philosophy is to provide end-to-end solutions using state of art process. We are associated with Chartered Accountants, Practicing Company secretary and lawyer. To deliver quality service with an emphasis on integrity. To be open and honest in all communications. Associated with highly qualified and experienced Professionals.